Hello everyone. I have finally finished my first painting of 2014. I originally had another drawing on the go, but I came across one of the most beautiful little towns I’ve ever seen. 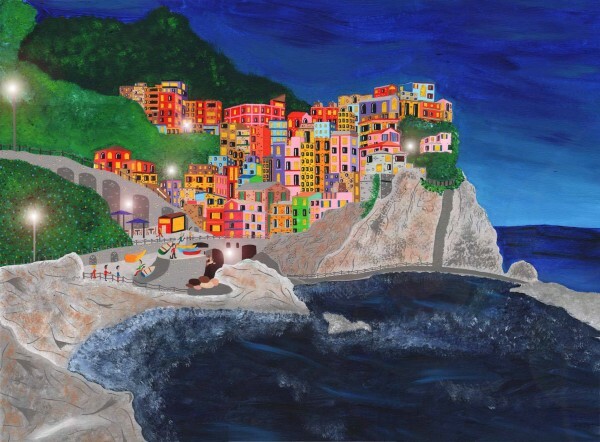 It’s a little village called Cinque Terre, in Northern Italy. It is a little village which is precariously perched on a high mountain top, which looks just stunning. But it’s not just the height and built up nature of the buildings that drew me in, its the vibrant and bright colours of the buildings. The village is awash with reds, yellows, pinks, oranges and blues, which just simply looks beautiful. And for everyone that knows my work, it was perfect for me to paint! So I suddenly suspended my previous drawing, and immediately started work on this piece. This is again available to buy from the Gallery that represents me, either as the original painting, or as a limited edition print. The link for the site is below. I hope you all really like the piece! Read more about… Cinque Terre, Italy.